Homemade Peppermint Foaming Hand Soap is so easy to make with just a few ingredients, and it’s perfect for Christmas too! Every year for as long as I can remember, I have made a bee line straight to Bath and Body Works as soon as the Christmas spirit hits me. They have those crazy foaming hand soaps that smell like Christmas and they are usually on some crazy kind of sale where you buy 3 and you get one free…then you get to the checkout and your bill is like $427 for 4 dang containers of foaming hand soap…and you buy them anyway because you just waited in line for eternity and you just can’t leave the pepperminty hand soap there, right? WRONG! Folks, you can make your own and save that money! 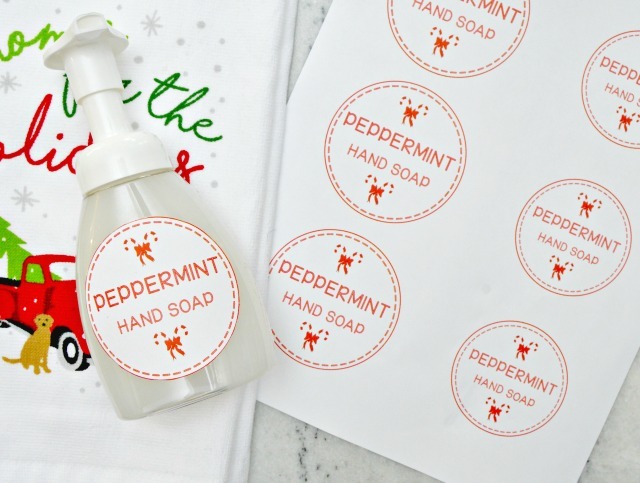 And just in case you are thinking that it won’t be near as cute as theirs, I’m supplying you with some adorable Peppermint Hand Soap Labels so your soap can be cute too! Whoop! This post contains affiliate links, which means that if you purchase using one of my links, I will receive a small commission. 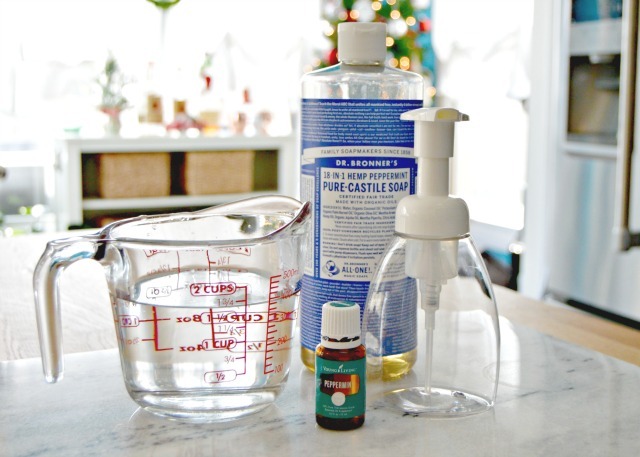 Start by adding the Castile soap and peppermint essential oil to the foaming soap dispenser. Next, pour water into the foaming hand soap dispenser, stopping about an inch from the top. Replace soap dispenser lid and shake well. 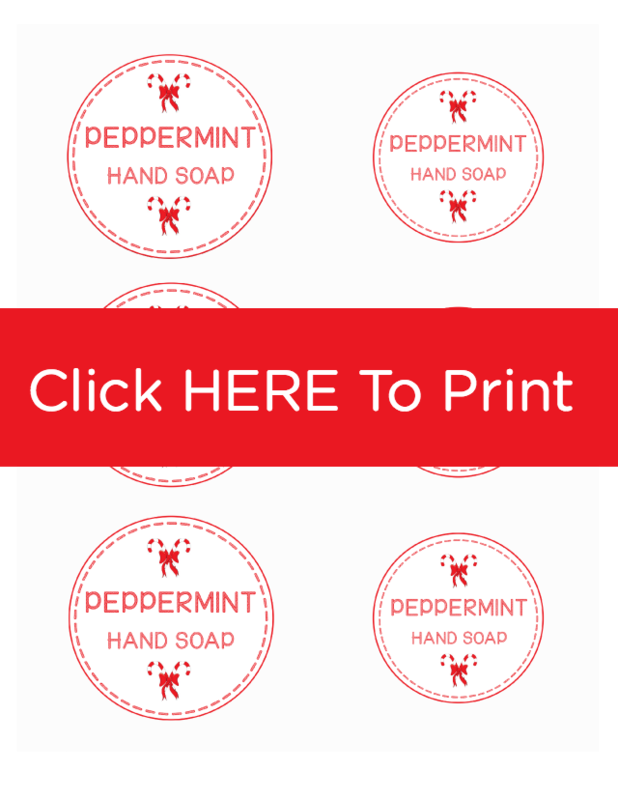 Print my Peppermint Hand Soap Labels and apply to the front of your soap dispenser using a glue stick, tape or by cutting a piece of clear contact paper and placing it over the top…cute, right? 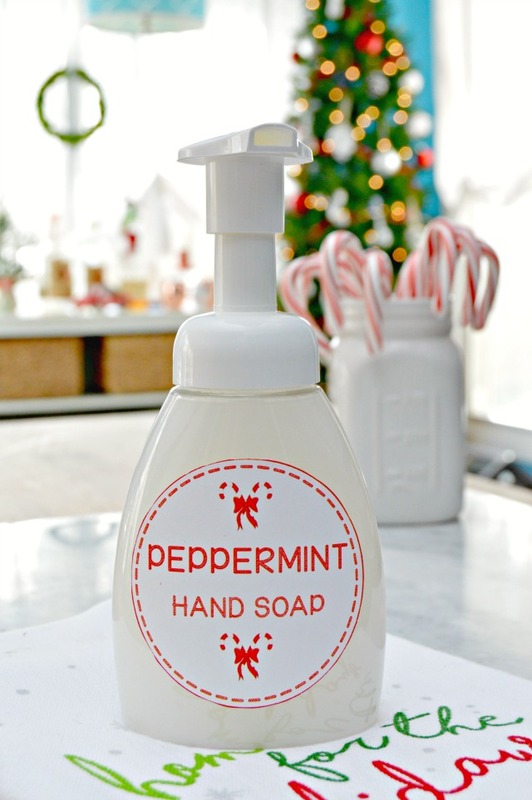 Now that you know how to make your own Peppermint Foaming Hand Soap, you can make it for yourself, all your bathrooms and kitchen, or even make some to give as gifts this holiday season! Also…change up the scent…if you don’t love peppermint, just switch out the peppermint essential oil for a different scented essential oil like Orange, Lemon or whatever scent you love! Love, love the peppermint. I bought foaming soaps at Dollar Tree. Dump the soap in a container and stick under the sink. Refill containers with well now Peppermint. Gift to my sisters and friends. All that soap under the sink takes a yrear to reuse in my bathroom for the rest of the year. Win, win. Thanks. That’s a great idea! Thanks for the sweet words, Jody! Heading out to the store right now to get ingredients! thanks so much for the instructions and the cute labels. Of course…hope you enjoy them! I haven’t…probably because it isn’t super concentrated. To be honest, I haven’t had an issue with the oils causing damage to any of my plastic spray bottles either. Thanks, Jess! I’m definitely trying this. I love all your homemade cleaning supplies! Keep it up! Citrus oils will do this, did you happen to use a citrus oil? Would distilled water be a better choice than plain tap water? Thank-you so much for this recipe. 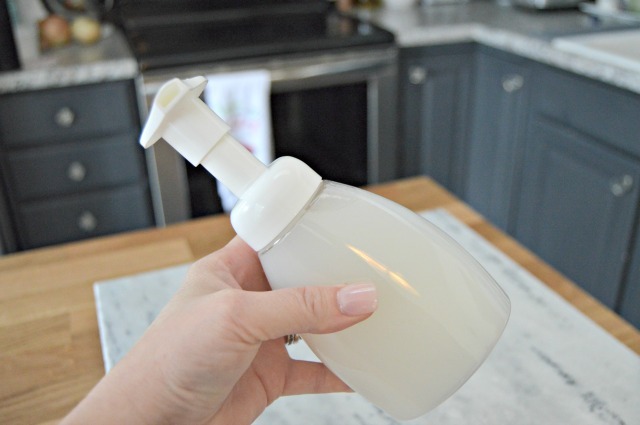 I have an empty foaming hand soap container and I just made some of your delightful peppermint foaming hand soap – I had all the ingredients just waiting for your inspiration. I just ordered your foaming dispensers and will make some of these for gifts in three fragrances (great offer on Amazon with these for Castile soap too!, although I have the same peppermint version of Dr. Bronner’s that you show for now, maybe this other version would be good for the lemon or orange fragrances). Thanks for the lovely label too! Two recommendations: (1) Could you create a label template that we could modify if we want to make other fragrances like lemon, orange? Also (2) It would be helpful if you would include the amount of water to be added as we may have different size containers. It looks like the one you used is 250 ml. How many ounces of soap do you use? Can I add hand sanitizer to this recipe? If so, how much do you suggest? Thanks for all your ideas. I look forward to checking my emails on the outside chance you have done something new and unique! I never cease to be amazed at your recipes. I use one in the shower; one for the microwave, and on and on. AND they work!This peppermint mix is super neat but I have to order the foaming hand soap dispensers so it may be a New Years present. Last minute Lizzie here! ok what did i do wrong? Mine isn’t white like yours is. Its clear with some foam on the top of it. Did you shake it? Because it doesn’t contain chemical binders, the ingredients sometimes separate…just give it a shake. Can you give me information on where to buy the plastic bottles and top dispenser for foaming hand soap. Thank you for the wonderful reciepts. Since the Peppermint in the Anti-Bacterial Cleaner is a natural antibacterial, then wouldn’t the same thing be true in the Peppermint Foaming Hand Soap? (I truly enjoy your recipes and free print outs, THANK YOU!!!) I am preparing to give several people the Peppermint Anti-Bacterial Cleaner in those darling containers you recommend for Christmas. And, this “PABC” makes a nice gift for those who cut my hair, give manicures, etc., because I would rather do this than candy or cookies. Thank you, Jessica, for your creativity, hard work and great website. Merry Christmas and a Happy, Healthy and Wonderful New Year! I have tried several times to print the labels and it does not work…..can you help please? ?